One thing we didn’t realise before planning our journey around New Zealand was the climate, which bears an uncanny resemblance to the UK with average maximum summer temperatures between 20 and 30 degrees and winter between 10 and 15 degrees. After getting over the annoyance of travelling half way round the world for the same type of weather, we decided to make the most of the cold and climb a glacier! Fox Glacier New Zealand As we’re on a budget (and couldn’t quite stretch to the heli hike option), we opted for the half day trek up the Fox glacier on the west coast of the south island. 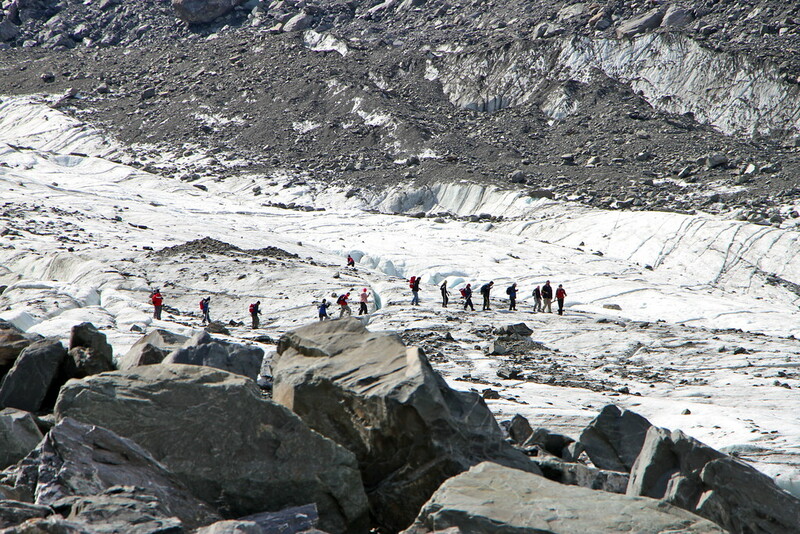 Our trek would take us from the valley, up onto the face and the body of the glacier itself. 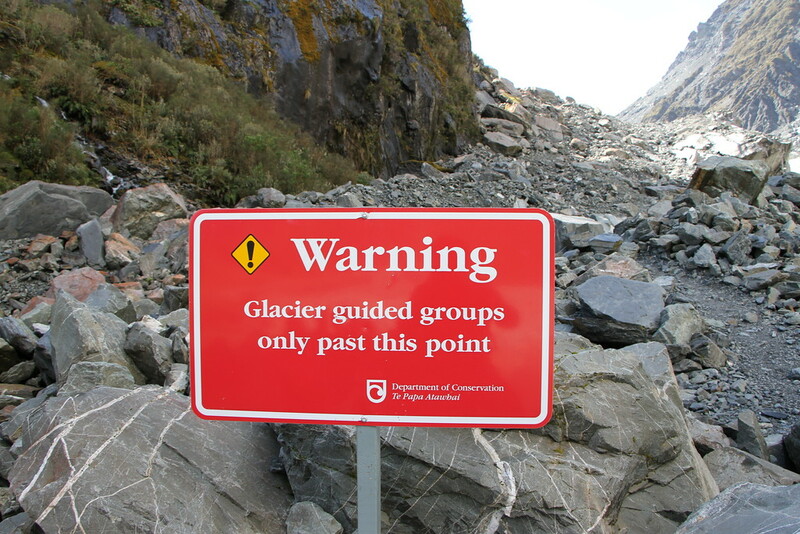 We’ll admit, we didn’t know much about glaciers before we decided to climb one (aside from they are cold and move slowly), which is why we booked a guide to take us onto the glacier! We were warned about changeable weather conditions, and should be prepared for every eventuality on the glacier. Our solution? Layer up, big time. So much so we both resembled the Michelin man as we dawdled into the Fox Glacier Guiding offices. In retrospect the wooly hat, hoody hood up and waterproof was probably a bit excessive, and with the amount of sweat that was dropping off us, they probably thought we were clinically obese. Either way, we got checked in, stripped off some layers and eagerly awaited our first glacier hike! First up was getting more stuff for the hike, wait didn’t we have enough already? We swapped our walking boots for glacier boots, grabbed another rucksack and loaded up on crampons for the ice. We looked like pros, we had no idea. Our group of 10 loaded onto the bus for the 15 minute drive to the glacier valley, carved out over thousands of years. Hopping off the bus, we were on our way to the face of the glacier. Stepping onto the ice for the first time was exciting, as was stomping around with the crampons to make sure we didn’t slip. And then we began climbing the glacier, around deep blue crevasses, and along and over ice cold water flows on top of the glacier. We were incredibly lucky to have a clear, sunny day on the glacier which gave us unobstructed views of the mountains around us. After climbing for 40 minutes, we stopped to admire the view and gather our breath before the descent back down. Before long we were taking off our crampons, packing them away and making the trek back down to the valley floor. 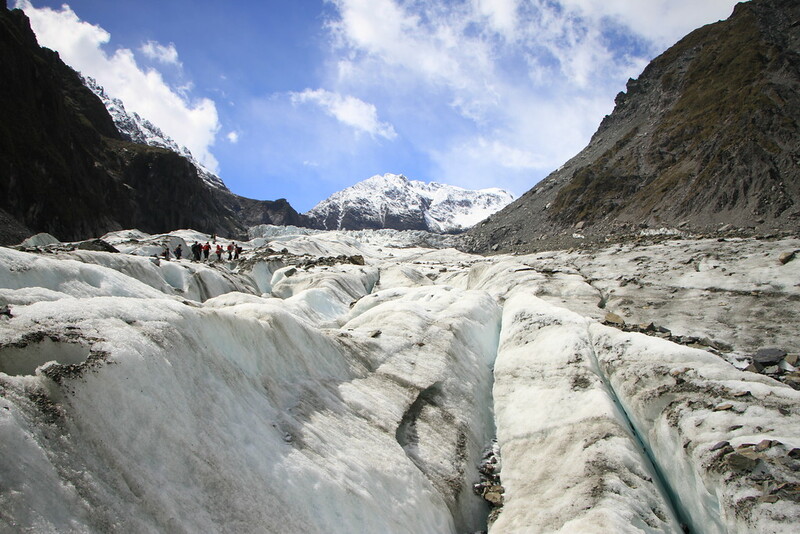 If you do decide to climb a glacier, the decision is a pretty simple one: Franz Josef Glacier or Fox Glacier. Our advice? If you’re travelling North to South on the west coast, take a walk to Franz Josef first to have a sight of the glacier, wet the appetite, and then drive down the next day to Fox to actually climb the glacier. 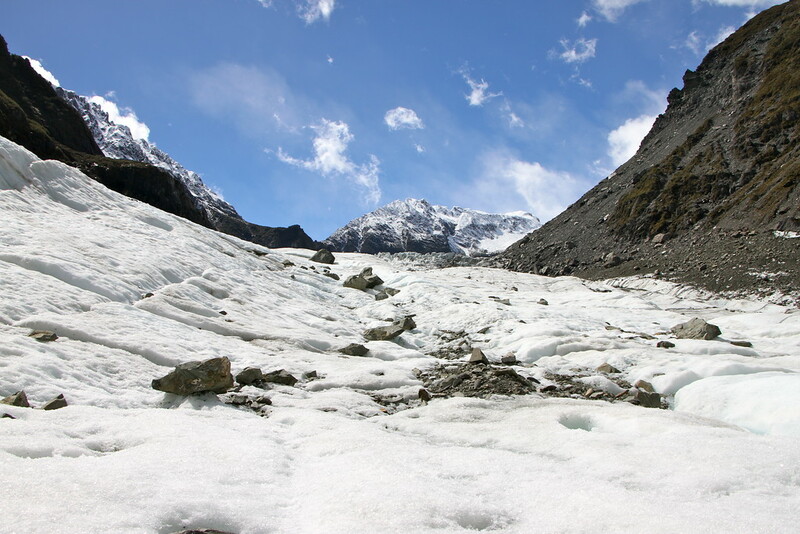 If you’re going South to North, have a look at Fox glacier and then the next day climb Franz Josef. 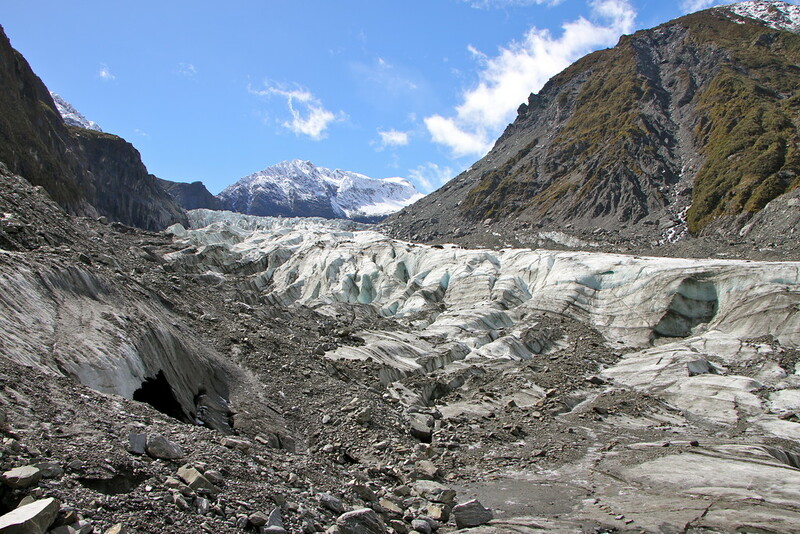 Both had been recommended to us, but we opted for the Fox Glacier as it fitted in better with our south island route plan, and we’d heard it may be a bit quieter than Franz Josef. As we didn’t do Franz Josef, we can’t really comment on how busy it was, but whilst we were on the Fox glacier, we only saw two other groups in our three hours up there. Very cool, both figuratively and literally. We loved our time on the glacier, and if we ever returned we’d probably splash out on the heli-hike option to see even further up the glacier. We’d probably have to put more layers on as well, which would probably be more challenging than the hike itself! Alongside the Tongariro Alpine crossing, this for us is a must see and do in New Zealand. So great to read about your glacier hike…brought back memories of our heliflight to the top of Fox. Do hope you are continuing to enjoy your world tour – we are loving reading about your adventures. P.S. We are still trying lots of New Zealand wines (!!!!!) now we are back in UK and after our wine trip with you both. Thanks guys, wish we’d done the heli hike as well! Maybe next time! Very jealous of the New Zealand wine tasting, it’s not so easy to get it in Chile but at least the Chilean wine is good as well! 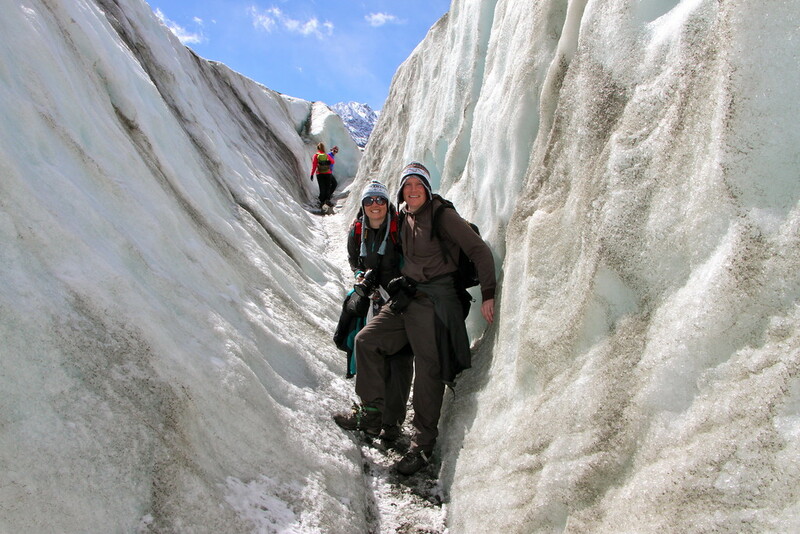 Would you still happen to have the name of the company you went with for the Fox glacier hike, please? I can’t seem to find any hikes that go onto the glacier without being transferred there by helicopter. The non-helicopter ones only seem to go up to just before the start of the glacier.